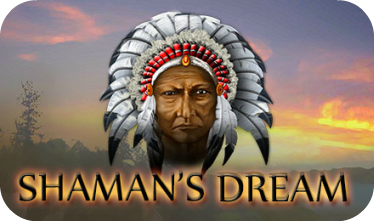 Immerse yourself into the Native American culture when you play Shamans Dream, one of the best known titles we have in our collection here at Slot Shack. This 5 reel, 25 pay line slot machine invites you to travel back in time as you try to uncover the non-progressive jackpot prize of £9,500. As you play the game you will encounter various symbols such as wild wolves, wigwams, tomahawks, a dreamcatcher, a squaw, hunting bears, spirit totems, eagles, white buffalo and the ominous Chieftain. The design and layout of Shamans Dream has been very well thought out as the reels are bound with wood and rope and the pay lines are displayed on Indian feathers. The background offers you a view of a dusty desert with a flaming red sunset sky. To the top of the screen you will find your balance, bet amount and any winnings – to the bottom of the screen is the pay table, betting options such as bet per line, auto play and the ‘gamble’ feature. The only feature that Shamans Dream offers is the free spins bonus feature. To trigger this, you need to land three or more of the dreamcatcher symbols on your pay lines, this will automatically award 15 free spins which can be re-triggered at any time by spinning in 3 or more of the dreamcatcher symbols during the free spins mode. During free spins, all winnings will be multiplied by 3 - depending on your bet, this could be very profitable indeed. The white wolf symbol is the wild symbol and will substitute for all other symbols except the white wolf scatter symbol. As mentioned briefly above, this online slot game offers a gamble feature which allows you to gamble your winnings. If you decide to gamble, two options will be shown on your screen, guess correctly to have your previous winnings doubled – guess incorrectly and you lose your previous winnings. The gamble feature allows you to win a maximum of 32,000 coins or five correct guesses. We expect you will have great time playing Shamans Dream here at Slot Shack.